Jetstar’s Australian boss David Hall has swapped his suit and tie for an orange jacket as he took to the skies in the name of charity. 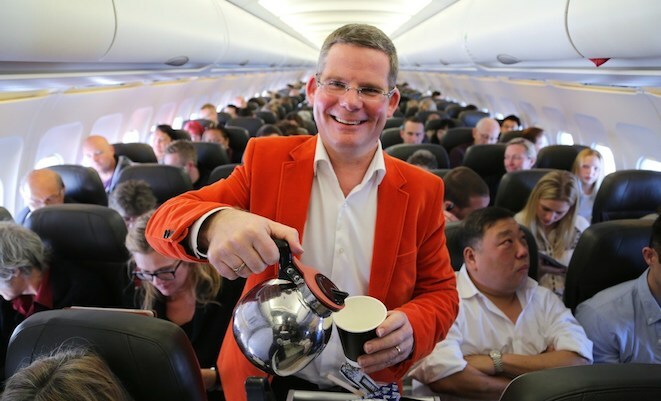 Hall took on the role of flight attendant on a pair of Jetstar flights between Melbourne and Sydney on Friday, offering passengers free tea and coffee to raise money for StarKids. The flights – JQ 502 and JQ 507 – raised $1000, which the Jetstar Australia and New Zealand chief executive pledged to match dollar for dollar. StarKids is a partnership between Jetstar and World Vision which supports underprivileged children in Australia and across Asia.